Six months ago, Google Reader disappeared. Some still miss it, but most users have been trying other applications to fill the gap left by Google Reader. However, there aren’t many choices on the market, so the developers of gReader, noinnion, have launched News+. News+ is a highly customizable news reader, with a simple interface, fast and intuitive. It enables synchronization in both directions between News+ and the server, so the news you see are always on time. You can activate the off- line reading, and the news are downloaded to your mobile phone. Thus, you can read them without needing Internet access. You can activate this option in the settings menu, by selecting ‘0Offline Usage (beta)’. In the menu, we can also select the number of feeds that will be downloaded. There is also a read service, which read aloud the news when we can not read. The news can be fully downloaded with all the content on the web (Normal mode) or we can download only the content of the article (Simplified mode). News+ is optimized for tablets and smartphones, and we can organize the news in both devices via folders or tags. Other features include: notifications system, the option to share news, a dark theme which save battery and it’s more comfortable to read at night, and reading mode with full screen, which hides the notifications bar. You can download News+ at Play Store. It has a free version and a paid one, which allows including more extensions than Google News. 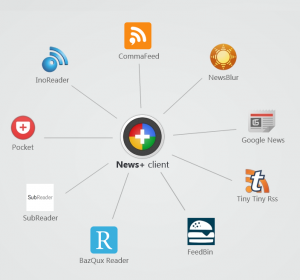 Extensions compatible with News+ are varied: Google News (included), InoReader, BazQux Reader, Tiny Tiny RSS, FeedBin, NewsBlur, Pocket, SubReader, Reedah, CommaFeed, and Google Reader API Clones.